The priests looked up in horror as there was a great, deep growl from above them. Somewhere, in the vast impenetrable body of their World and their God… metal ground to a halt. It was a horrifying noise that set the entire city on edge. It was not particularly loud, no, nor was it high pitched or rumbling or annoying. But it meant bad things to come. Very bad, indeed. Although nobody spoke about it, the beats of the gears and their world were slowing down year after year, after beating steadily for millennia. Everyone was horrified. The smaller mechanics, for which they used to modify themselves over time, were unaffected, but the great gears, including the massive golden mountain on which their city was built, were turning a little slower, and sometimes unevenly. The high priestess even halted her studies on ectogenesis in an attempt to consult with the God, although the great God and World never answered. So she organized a group to set out in adventure, to seek out the source of this slowing, this unevenness. They chose a group of children, as of yet unchanged by the gears and mechanics that would become part of their bodies come puberty, or when young legs were inevitably crushed between gears in a moment of carelessness. After all, children were small and fast, and expendable, capable of getting into the smallest places. They set off through the gardens, first, the ever-shifting irrigated gears, each one almost as large as their city alone, where earth- real earth- filtered in from somewhere above, unseen by gears, and where crystalline growths provided brilliant golden light that made the brass, turning walls of the world glow. They collected food to carry with them in their knapsacks of spun, silken silver, and left for places unknown to the city. 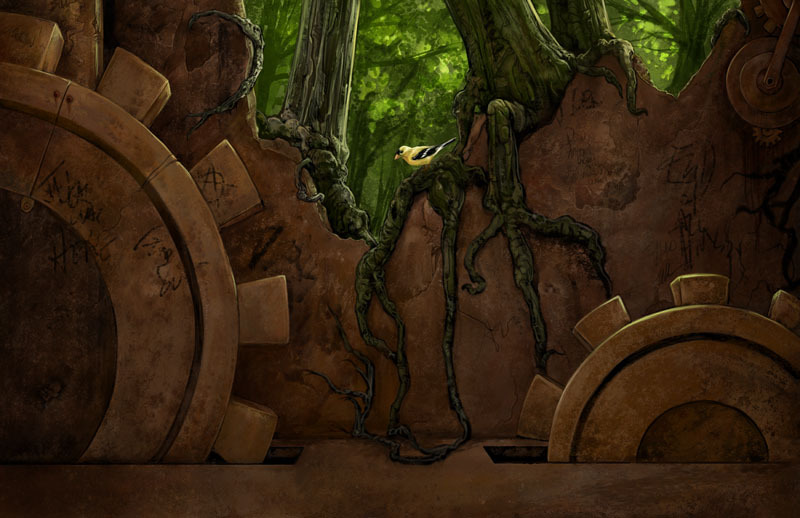 One of them found a way to climb the gears up, seeking out where the earth and water that filtered into the gardens came from, suspecting that perhaps the earth had jammed a gear, or the water had rusted somewhere (although he knew the World and God never rusted). He was a tall child, with dusky hair and pale eyes, who dreamed of one day becoming such as the high priestess, a being of pure metal and energy, instead of his fleshy, tainted birth-body. Another set off northwards, where magnetized needles always swung to point, deciding that perhaps somewhere the God and World had become a simpler metal, one that could be swayed by magnetism, and that the source of the northern magnetic field could be obstructing it. She was a smart girl, with dark hair and eyes and a strong ambition to perhaps be a priestess herself someday. The third left the group when they encountered a place so dark that no light could be seen, and had become separated from the group- as he was always a little hard of hearing and clumsy, a poor trait amidst the World and God, where the clicking and groaning of a gear was one of the only ways to tell if one was going to trap and pin you. He wandered into the darkness, afraid and disoriented, until he emerged to the west, although he didn’t know that direction. The last two decided that it was a poor idea to split up, being siblings, twins, an extreme rarity, and being very much connected on a deep, needy level. They found a tunnel that lead down, down, spiraling down into a staircase of pistons and tubing amidst the churning cogs. And they continued as such, down, down, into darkness and towards a light more pure and white than any they had seen before in the distance. Many years passed before they returned. And in those years, the high priestess found that their God would no longer convert the children who reached adulthood, to her utter horror. Gears ground to a halt in some places, while others spun wildly or broke lose, now and then. She feared that her five had truly been sent to their deaths, and wept tearlessly for them, her crystalline diopter eyes having no fluid in them. Their city was ruined, their population diminished. The gardens swelled with fruit unseen before, and sometimes whole plants or strange dead creatures fell from above with the earth and water. A flood had ravaged the city streets, one year, and another year random storms of static and lightening flashed through a neighborhood, burning flesh and stopping gears where they stood, and causing many of the eternally-glowing crystals to shatter and fall dark. A tall man, with skin tanned darker than any the city had seen, an earthy bonze, his hair golden as the gears and pale eyes harsh and squinting to see in the dim light of the city. His flesh was windburned and lined with hard work and scars, and he carried with him heavy boots laden with dirt and a staff of wood- and a device made of a dark blackened metal, which he used to dispatch a priest who had gone mad and attempted to attack him, bursting his copper-plated skull and scattering wired brains everywhere. He spoke of another World above, one that was not the God and World, where earth covered everything and plant life grew abundant, and people who never changed into machinations lived and worked, and had believed the world below them populated by monsters and demons that had been locked away to squander out of the view of the sun, a massive light so brilliant it illuminated the entirety of the World. A World that was much bigger than the God and World, that lead all the way to a place, land where the God and World was nowhere below, and nowhere near. The high priestess claimed blasphemy and had him chased from the city, but in her ticking heart, winding down, she knew and feared he spoke the truth. Shortly after he left, the woman arrived, her dark hair elaborately braided, her dark eyes smart and sharp with intense knowledge. At first the priestess thought that she had been changed and was to accept her as one of their own, but her shined skin was not metal, but some sort of material that was both hard and flexible and did not break, shattering the points of spears when the guards tried to force her out. Her insides, visible through opalescent and translucent panels here and there, were formed of electricity and wires, such small unmoving mechanics sickening to the priestess. She spoke of another World to the north, where the unmodified and newly modified lived together in synchronicity, where the entire horizon was blanketed with frozen water in many different forms- both white and granular and sheer, where the sky was endless and black and the sun- an eternal light- rose only once per year and set once per year. And of people who knew such horrible things about the God and World. The high priestess screamed blasphemy, and bade her to take her leave. The woman refused, and took up residence in an abandoned home, working with information projected of pure light and silver-and-white technology unseen. From the west came another. His skin was burned and scarred heavily, his hair fallen out, his teeth rotten, but his body muscular and strong. He carried a knife made out of white bone and a sack of dead creatures he called fish, preserved in glass jars, nothing the city had seen before. He heard nothing, but could still read and speak just fine, although he reacted to any movement near him with an animal shout and a swing of the knife. He gibbered and claimed to have come from a World of water, endless water, where small groups of people and other creatures clung to life on drifting cities and small floating homes. And of creatures, some so massive they could swallow a thousand people whole, and others that were small and so vicious a dozen of them would strip one to the bone in seconds. The water was bottomless, he claimed, and he spoke of seeing the World and God from the outside, and that it was not endless, that it ended where the endless water dropped into falls so high that the people spoke that there was no bottom to it. The high priestess relaxed the city’s vast discomfort by claiming that the boy must have gone crazy in his long years of isolation, and bade that he be rejoined with the God and World, although the metallic woman with dark hair and eyes shielded him with a bubble of pure light and energy before they could herd him into the crushing gears, and they let the two of them be out of fear. Then the fourth arrived, quite surprisingly alone and detached. She spoke little, and wore only scraps of clothing underneath crude scrapped armor made out of curious shells and a heavy cloak, constantly complaining of the cold. In all, she was quite benign compared to the others, peacefully accepting food and watching the priestess distrustfully. One could have even thought she was entirely unmodified until, in a moment of carelessness, another set of arms reached out from under the cloak to adjust her armor. It was not until pressured that she spoke of a world below, where she, and she truly, had found the source of the God and World’s ails. Water poured in on all sides of this world, salty and rich, bringing creatures and refuse plants with it. Above, a layer of crystals so pure and white and brilliant it was impossible to see the God and World, and in the swampy, still waters down below, pillars supported the God’s weight and rocky spires and masses of soggy land that collected around either of these formed small islands. And it was there that the natives of this land, curious and intelligent, but still shy, and very very strange if medically skilled, had led her to the source of the god’s problems. Although she hadn’t said much before, she described what she had seen in vivid, triumphant detail. There was another God, one who lurked below in the swampy waters, and was locked into battle with the God and World. The natives had bade her to dive into the waters, and in the deep, she saw them, trapped under heavy waters- the God of Flesh, whose massive limbs and tendrils and all other appendages she could not even find words to explain had crawled up through the water and the pillars and rock spires and had jammed themselves deep into the heart of the God and World. But the God and World had responded in kind, a massive mechanical weapon poised over the God of Flesh’s heart ready to drop the moment its unending mechanical heart stopped. They were locked in a stalemate, neither one willing to destroy the other for knowledge of it’s own destruction. At this, she had burst out into hysterical laughter, and the priestess looked into her eyes and saw pain and madness…but also honesty. The priestess, in a rare moment of humanity, asked of the woman what had become of her twin. The woman responded with a confused stare, before removing her cloak, revealing the extra set of arms was not where her strangeness ended, as another set of eyes rested above her ears, and her skull arced back in such a way that there would have been two minds crammed into it. Her back was hunched, slightly, but she smiled, and explained that they were both here. There was nothing to worry about. And the high priestess finally relented, and simply howled her frustrations. The woman left before the priestess could collect herself enough to reach a decision, and the mechanical woman, the leader of her people…retired to her private labs and collapsed. Her heart, in all it’s whirring, ticking glory…could not take any more of this. And unknown to her and the city, five (or perhaps four, depending upon your beliefs) met in an abandoned home on the edge of the city, drawn together perhaps by fate, or luck, or some greater planning. “S-so weh hab to keel dem, righ?” The deaf man inquired, shaking and shrugging, the scarred skin on his back stretching as he sat. “…Good question.” The two-in-one chuckled, then laughed, and then cackled with an exhausted sort of delight. It was no more than a few days later that the high priestess sat in her chamber, and heard something that made her cold metal heart skip a beat. The ticking of the God and World stopped, suddenly, eternally, and instantly she knew in every fiber of her metallic being that it was the end of the World. Before the gear under the city gave way, and everything began to crumbled and fall. The high priestess, in reality, was one of the lucky ones, desperate and strong enough to scamper through the ruins as they tumbled and collapsed in on themselves, falling seemingly endlessly, until she finally reached a point where the gears gave way to crumbling earth. Her sharpened needlepoint fingers grasped at grass and tree roots for purchase, and her crystal eyes looked up. She saw the sun, a ball of fire so bright yet far away she could hardly comprehend the very notion of it, much less fully accept what she was seeing, and then something came over her head, a carriage hoisted into the air by blades moving so rapidly they flowed into one. And with the last tic of her heart, she saw four faces (but ten pair of eyes) looking down from the bizarre vehicle, smiling in triumph. Her heart went still and she fell into the gaping crevasse where once two gods fell to sleep and battle. And the ocean quickly filled what was left of the hole, as if it had never been there in the first place.